When he learned I was going to be on the TODAY show, Chris joked that he was every-so-slightly disappointed that Natalie Morales wouldn't be coming to our house for the interview. I like to think he has a thing for smart brunettes. As always, he is my strongest supporter. I was glad to see he and Quinn got some face time in the segment. I have been overwhelmed by the outpouring of support from my community -- friends, family, sisters in mets, and people I don't even know have rallied behind me. Thank you guys. I am slowly digging my way through the emails and comments (tough when Quinn pulls my phone out of my hand and yells "No more screen time, mom!"). Touché, kid. Anyway, here is the segment I did on TODAY. I am encouraged by Joan Lunden's call for more funding for metastatic breast cancer, which is the only way those of us with Stage 4 are going to beat this thing. You can read the accompanying article here. As I wrote on the Huffington Post, "When we are loud enough, our voices are heard. 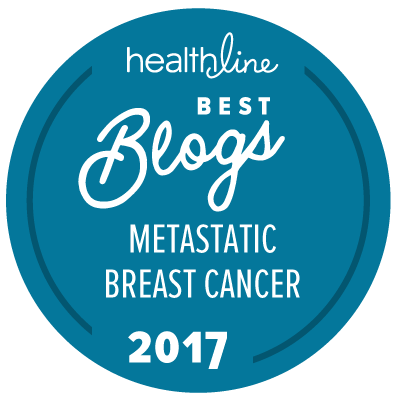 Slowly, the conversation about what metastatic breast cancer is and how we're going to address it is beginning, and the face of "awareness" is changing. I am honored and humbled to be a part of that progress." Wow..that was powerful! Prayers and Peace to you all as you "fight" for your life. Libby Stillman...friend of Jill and Bob Jones. Thanks, Libby! Any friend of the Jones' is a friend of ours!